If you are like me, you are probably trying to figure out how to pronounce this word unless you are of Greek origin. Historians will inform us that these Greek twist cookies can be traced back to Crete during the Minoan civilization (ie 2600 to 1100 BC). Needless to say, these cookies have been around for a long time! Koulourakia were traditionally considered to be Easter cookies, since they would be eaten on Easter Sunday, following the Lenten fast. Today, they are considered festive cookies that can easily be found at all major Greek holiday celebrations. They are also great cookies to make for fund-raisers and for festivals. Once you taste this cookie, you will understand why they are now made throughout the year! A traditional Koulourakia recipe will actually include baking ammonia, which as you probably know is a leavening agent. I hope to share that version of this recipe in the months to come. In the meanwhile, I will share a “modern” version of this recipe which is made with baking powder. The whole process begins in the bowl of a stand mixture and a paddle attachment. Rub or whisk together the orange zest and the sugar. Next, add the room temperature butter and cream together until light, fluffy and pale looking. This can take up to 5 minutes. Remember to scrape down the sides of the bowl a few times in order to properly incorporate the butter and sugar. Since this Greek cookie has been around since forever, there are probably thousands of variations. I have seen some recipes that will add melted butter, others will add both butter and shortening, I have also seen a vegan version of this recipes …truly endless variations. Like I always say, there is no right or wrong recipe. It is always a matter of personal taste and preferences. The eggs are next. These need to be added one at a time and once again, scrape down that bowl. You can now add the rest of the liquids. It is now time to add the flour and baking powder. This is what I do: I start by adding 420 grams (3.5 cups) of flour which has been sifted with the baking powder (if you do not have a scale, always fluff and then scoop up the flour). Once combined, the dough should be soft but not sticky. If it is sticky, add a few tablespoons of flour until you get it to that consistency. This is a soft pliable dough and as a result, it can be made into different shapes and sizes. Some are traditional, some are not. Some are quicker to make than others. Whichever shape you decide to make, start with about a heaping tablespoon of dough (note that by using a disher ie: a cookie dough scooper, your Easter cookies will all be the same size and bake evenly). There is no need to use flour on your board, as you want your dough to adhere to it as you are rolling and shaping the dough. Are you ready to roll? Scoop the dough with a medium sized disher and roll into a 1-1½-inch ball. Repeat. Roll the balls into 7-inch log shapes and form the letter “T”. Pick up the middle section and place it between the other two sections thereby creating a braid. Complete the braid, cut off the end and gently tuck underneath. Continue in this manner until all the dough has been shaped. Total yield is about 2 dozen cookies braided in this fashion. Once you have scooped out your dough and formed your 7-inch log shapes, simply place in an upside down “U” and twist together. These are a lot faster to make and will yield about 3 dozen cookies. The hairpin and long braided koulourakia make them the perfect dunking cookies for your coffee. If you prefer, they can be shaped into circles, braided wreaths, horseshoes, letters of the alphabet, scrolled “S” -really any shape you like! As was mentioned, regardless of the shape, try to keep them the same size so that they bake evenly. Koulourakia are pale in color, and so you will find that an egg wash (made with one egg yolk and water) will provide a gleaming color. Sesame seeds are optional. Once they are baked, they will keep well for two weeks at room temperature or can be frozen for longer period. As many of you know, I would much prefer to have a cookie (or two) with a cup of coffee than a slice of cake. As a result of this lifelong fascination, I am always on the look out for cookie recipes… that’s just my way! Truth be told, I wasn’t really interested in the Italian cookies. I had a mother, two nonnas and a couple of aunts that were amazing bakers… I have already shared so many of these recipes with all of you… lemon knots, biscotti, amaretti, ciambelline… Italian cookies I know, up close and personnel. 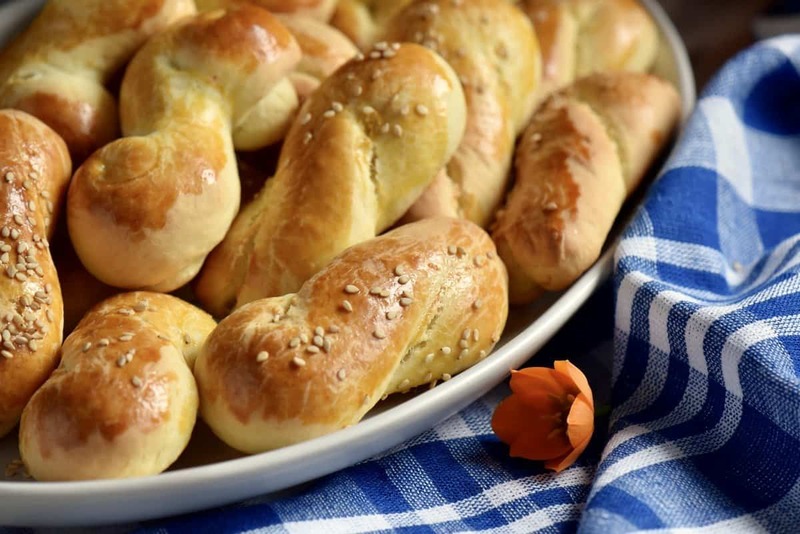 Through the years, I have made changes to this Koulourakia recipe, as I had occasions to speak with colleagues that were of Greek origins and of course the γιαγιάs of my Greek cousins. 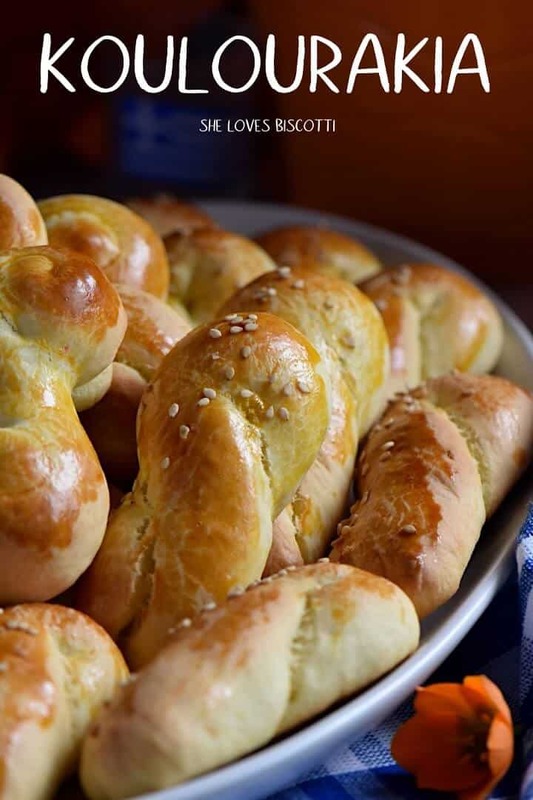 Do you have a different recipe for Koulourakia? I would love to hear about it in the comments! To all of my Greek friends celebrating Easter this week-end… Kalo Pascha! Preheat oven to 375°F (190°C). Place rack in the center of oven. Line cookie sheet with parchment paper. Sift together 3½ cups flour and baking powder and set aside. The other 1/2 cup of flour is reserved in case we need to add extra flour (see recipe note). In a bowl of a stand mixture, with the paddle attachment, whisk together the orange zest and the sugar. Add the cubed room temperature butter and cream together with the sugar until light and fluffy. This can take up to 5 minutes. Make sure to scrape down the sides of the bowl a few times. Add the eggs, one at a time beating well and scraping down the bowl between each addition. Add the egg yolk and again, beat well and scrape down the bowl. Add the vanilla extract, orange juice, milk and ouzo (if using). Beat together for 30 seconds. On low speed, add the 3½ cups of flour and baking powder. The dough should be soft but not sticky. Add a few tablespoons of flour if the dough is still sticky. (Optional: cover dough with plastic wrap and chill for 20 minutes). With a medium sized cookies scoop, portion and roll into a 7-inch log. Shape into desired shapes (braids, pinwheels, twists, etc...) Refer to pictures in the post. Place on parchment lined cookie sheets about 1 inch apart. Bake for 13 minutes or until cookies are golden brown. Allow to cool for a few minutes on the baking sheet before transferring to wire rack to completely cool down. Can be kept in an airtight container at room temperature for about 2 weeks. Cookies can also be frozen. The dough should be soft, but not sticky. If the dough is still a bit sticky, add up to 1/2 cup a flour, one tablespoon at a time until it is soft but not longer sticky. Very easy recipe and they’re a hit with my family!!!! How wonderful Angela! Thanks so much for taking the time to comment, appreciate it! Fantastic Denise! So glad to hear. Baking with daughters is so much fun! Thanks so much for taking the time to comment, appreciate it! I absolutely love these cookies and have made them for years, but have not used the orange zest but would love to. My question is does the zest make the texture in the cookie similar to coconut. I have texture issues and can’t eat coconut for that reason. What do you think. I had a most wonderful yiayia who taught me to make these and lots of,other things. Hi Mary, the orange zest is not as evident as coconut,so not as evident, but it is there. Perhaps you can use a spice/coffee mill to grind the orange zest with some of the sugar. That way, you still get the flavor but the zest will be a very fine texture. As an alternative, you can try using orange oil for baking… you still get the flavor without the zest. Hope that helps. Thanks so much for stopping by, appreciate it. Ooooo, I love the flavours in these cookie and all the intricate shapes! I have never had a lot of Greek food cooked by Greeks but I love trying Greek recipes. This one looks like one to bookmark. I grew up in a Greek neighbourhood, so even though I don’t have a speck of Greek in my background, it just doesn’t feel like Easter until I’ve picked up a few of these cookies from my favourite Greek bakery. They’re perfect for dunking into cup of strong coffee. One of these years, I’ll get around to trying my hand at making these myself… your step-by-step photos on how to shape the braids and twists makes them look much easier than I thought they would be! They look like the most delicious cookies with a cup of tea! And I love the shapes and braids! I had no idea that rubbing together citrus zest and sugar would infuse the sugar. That’s a great tip! Thanks for sharing! Such pretty shapes you made! I like all of them, and what fun would have been to give those shapes to the cookies! I don’t think I’ve ever had one, so I’m curious to try. Love the ingredients and the final texture/look. Like you, I’d rather have biscotti/cookies like these than a slice of cake 🙂 . What a great, informative post! I’m always drawn to cookies that aren’t too sweet, so these look great. Thanks so much Cathy! You are going to love these Greek cookies! Have a great week-end!